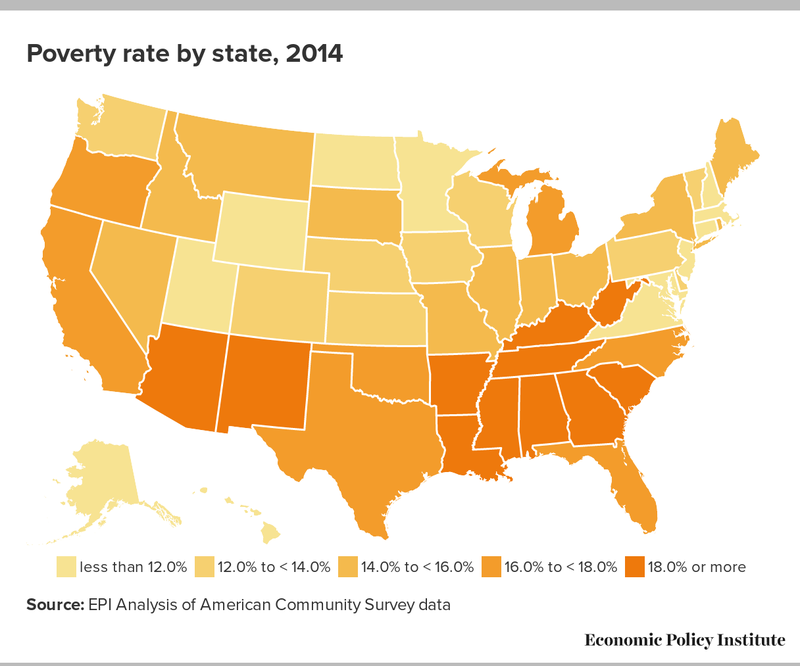 Between 2013 and 2014, the poverty rate in most states was largely unchanged, according to yesterday’s release of state poverty statistics from the American Community Survey (ACS). While the poverty rate fell slightly for the country as a whole, most of the changes at the state level were too small to signify a meaningful difference. As of 2014, only two states—North Dakota and Colorado—have poverty rates at or below their 2007 values, before the Great Recession. From 2013 to 2014, the national poverty rate, as measured by the ACS, fell from 15.8 percent to 15.5 percent. Poverty rates declined in 34 states plus the District of Columbia, but only five of these changes were large enough to signify a measurable difference: Mississippi (-2.5 percentage points), Colorado (-1.0 percentage points), Washington, (-0.9 percentage points), Michigan (-0.8 percentage points), and North Carolina (-0.7 percentage points). (A number of other states had similar reductions in their poverty rates, but the sample sizes for these states are too small to tell whether these changes were statistically significant.) Alaska was the only state where the poverty rate increased significantly, rising from 9.3 percent to 11.2 percent. The lack of improvement in state poverty rates echoes the trends we’ve seen in household income. However, the data suggest that the lack of real income growth over the past decade and a half has been even more pronounced for households at the bottom of the income scale. As of 2014, 38 states had lower median household income than in 2000, yet 47 states—nearly the entire country—had higher poverty rates in 2014 than in 2000. This is another reminder that the chief roadblock preventing greater improvement in living standards for middle-class Americans is also holding back progress in reducing the ranks of the poor: stagnant wages. While states can and should adopt targeted programs to alleviate poverty, these programs face an uphill battle if policymakers do not prioritize broad-based wage growth.